Can I just say that I love the advent of sites like Failbook and Lamebook because they publicize what I’ve been thinking all along? Think before you update. I’m not going to be like someone’s HR representative and say you must keep all of your social networking professional, but there is definitely a line between being social and being stupid. Today, I still think some of those values hold true, but I’ve loosened up a bit on who I friend. Sometimes it’s nice to see your fellow coworkers, bosses, or acquaintances in a non-work environment. I get a little peek into their passions, loved ones, and daily lives. Who knows? Maybe you’ll find out you have something more in common than your job. The reason Failbook and Lamebook are so popular is because we all have a Facebook friend who does the things they make fun of. We all have the emo friend, the inappropriate friend, the friend that advertises how much they party, who they date, misspells EVERYTHING, complains about his or her job, and gives off a negative online persona. Do we all have the right to do these things? Yes. But should we? That’s another story. 1) Do not friend your parents. Even if your profile is relatively clean, you never know when it backfires. Say you tell a white lie that you stayed in and did homework when instead you went out. Say your friend gets inebriated one night and writes something private on there that your parents find first (because if they’re anything like my parents, they get up hours before me). Honestly, they will either lather your page with comments and “likes” or they’ll catch something inappropriate that you or your silly friends write. 2) Do not engage in a heated political or social debate via someone’s wall comments. If someone wants to post an article in favor of health care or gay marriage, don’t use that as an excuse to go on a soapbox. 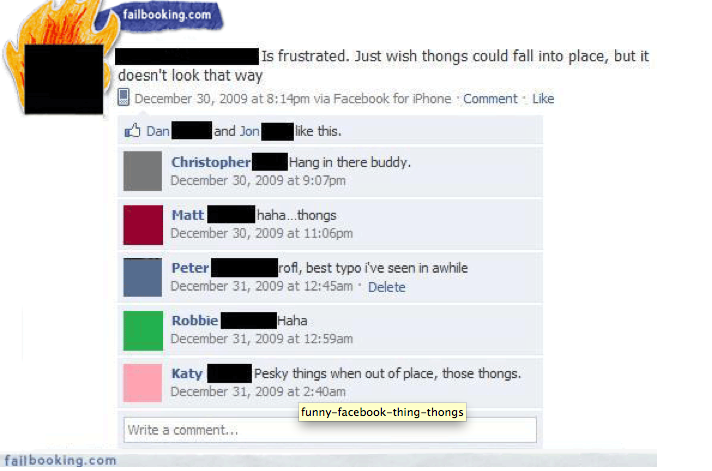 Facebook isn’t really a forum to have intense fights with your friends or your friend’s friends. Take it outside, people. 3) Do not write emo statuses unless you’re willing to acknowledge that you are in an emo mood for the irony of it or if it’s clear you aren’t about to jump off a bridge. It’s uncomfortable for people to read and makes whatever is wrong seem silly or melodramatic. If you really do feel those sad feelings, broadcasting it to the world probably won’t help and will in fact isolate you more. Sidenote: Emo songs are also included. I do love my share of Death Cab and Celine Dion, but paragraphs of heart-wrenching lyrics won’t change your luck in life. We’ve all had emo moments, but do you really want everyone to know? A blog dedicated to those thoughts or poetry might be better. 4) Do not make your profile open to the public. Do you really want ANYONE scrolling through your photos, your info and what people say? I took it a step further and made myself unsearchable, but there’s no need to go that extreme. I would advise making it open to your friends only. 5) Don’t post an entire album dedicated to your Mac Photobooth picture twists. Everyone who gets a new Mac does the whole picture distortion thing and it’s just weird. 6) Don’t friend your exes or their new girlfriend or boyfriend. It might be a fun game at first among your friends, but it ends up eating up hours of your time at night when you’re having one of your emo days…which in turn leads to more emo statuses. 7) Don’t over post on your own page. It makes you seem like you’re on Facebook too much or that nobody cares enough to post on your page. 8 ) Don’t gush to your significant other on Facebook. I’m not saying don’t show some online loving, but if your girlfriend takes up your last 10 posts, it might be too much. No need for an album of kissing pictures, closeups of you gazing into each others’ eyes, or little virtual gifts when you’re too cheap to buy a candy bar or something. It’s not pleasant to look at and it makes it seem like you’re compensating for something missing in your real-world relationship. 9) For the love of God…no Animal farms (farmville?) no virtual pets, no sorority life games, nothing other than the simple act of social networking and article/picture posting. If your page is filled with little turtles and giraffes, you have to find a new hobby. 10) Always log out. If you use a school computer and simply click off of Firefox, your profile is still logged in and subject to embarrassing posts from strangers. Also, NEVER give your password to anyone unless you have theirs in return. I’ve seen too many girlfriends hijack their boyfriend’s Facebooks and what dark direction that turns. And YES…even log out on your own personal computer. I’ve had my Facebook hijacked while going to the bathroom in my dorm. And don’t make your password your name. If you do, then you deserve to get it hijacked. If you have more, please leave a comment.